Traditional Tibetan history described the exploits of a lengthy list of rulers. External corroboration is available from the 7th century in Chinese histories. 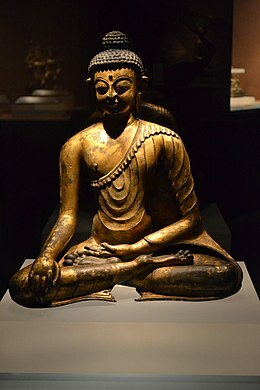 [note 1] From the 7th to the 9th century a series of emperors ruled Tibet. From the time of the emperor Songtsen Gampo the power of the empire gradually increased over a diverse terrain. By the reign of the emperor Ralpacan, in the opening years of the 9th century, it controlled territories extending from the Tarim basin to the Himalayas and Bengal, and from the Pamirs to what are now the Chinese provinces of Gansu and Yunnan. The power that became the Tibetan state originated at the Taktsé Castle (Wylie: Stag-rtse) in the Chingba (Phying-ba) district of Chonggyä (Phyongs-rgyas). There, according to the Old Tibetan Chronicle, a group convinced Tagbu Nyazig (Stag-bu snya-gzigs) to rebel against Gudri Zingpoje (Dgu-gri Zing-po-rje), who was in turn a vassal of the Zhangzhung empire under the Lig myi dynasty. The group prevailed against Zingpoje. At this point Namri Songtsen (also known as Namri Löntsän) was the leader of a clan which one by one prevailed over all his neighboring clans. He gained control of all the area around what is now Lhasa, before his assassination around 618. This new-born regional state would later become known as the Tibetan Empire. The government of Namri Songtsen sent two embassies to the Chinese Sui Dynasty in 608 and 609, marking the appearance of Tibet on the international scene. Songtsen Gampo (Srong-brtsan Sgam-po) (c. 604 – 650) was the first great emperor who expanded Tibet's power beyond Lhasa and the Yarlung Valley, and is traditionally credited with introducing Buddhism to Tibet. When his father Namri Songtsen died by poisoning (circa 618) Songtsen Gampo took control, after putting down a brief rebellion. Songtsen Gampo proved adept at diplomacy as well as combat. The emperor's minister, Myang Mangpoje (Myang Mang-po-rje Zhang-shang), defeated the Sumpa people ca. 627. Six years later (c. 632–33) Myang Mangpoje was accused of treason and executed. He was succeeded by minister Gar Songtsen (mgar-srong-rtsan). The Chinese records mention an envoy to Tibet in 634. On that occasion, the Tibetan Emperor requested (demanded according to Tibetan sources) marriage to a Chinese princess but was refused. In 635-36 the Emperor attacked and defeated the Tuyuhun (Tibetan: ‘A zha), who lived around Lake Koko Nur, and who controlled important trade routes into China. After a military Tibetan campaign against the Tang dynasty in 635-6, the Chinese emperor agreed (only because of the threat of force, according to Tibetan sources) to provide a Chinese princess to Songtsen Gampo. Circa 639, after Songtsen Gampo had a dispute with his younger brother Tsänsong (Brtsan-srong), the younger brother was burned to death by his own minister Khäsreg (Mkha’s sregs) (presumably at the behest of his older brother the emperor). The Chinese Princess Wencheng (Tibetan: Mung-chang Kung-co) departed China in 640 to marry Songtsen Gampo's son. She arrived a year later. This is traditionally credited with being the first time that Buddhism came to Tibet, but it is very unlikely Buddhism extended beyond foreigners at the court. Songtsen Gampo’s sister Sämakar (Sad-mar-kar) was sent to marry Lig-myi-rhya, the king of Zhangzhung in what is now Western Tibet. However, when the king refused to consummate the marriage, she then helped her brother to defeat Lig myi-rhya and incorporate Zhangzhung into the Tibetan Empire. In 645, Songtsen Gampo overran the kingdom of Zhangzhung. Songtsen Gampo died in 650. He was succeeded by his infant grandson Trimang Lön (Khri-mang-slon). Real power was left in the hands of the minister Gar Songtsen. There is some confusion as to whether Central Tibet conquered Zhangzhung during the reign of Songtsen Gampo or in the reign of Trisong Detsen, (r. 755 until 797 or 804). The records of the Tang Annals do, however, seem to clearly place these events in the reign of Songtsen Gampo for they say that in 634, Zhangzhung and various Qiang tribes "altogether submitted to him." Following this, he united with the country of Zhangzhung to defeat the Tuyuhun, then conquered two more Qiang tribes before threatening the Chinese region of Songzhou with a very large army (according to Tibetan sources 100,000; according to the Chinese more than 200,000 men). He then sent an envoy with gifts of gold and silk to the Chinese emperor to ask for a Chinese princess in marriage and, when refused, attacked Songzhou. According to the Tang Annals, he finally retreated and apologized, after which the emperor granted his request. After the death of Songtsen Gampo in 650 AD, the Chinese Tang dynasty attacked and took control of the Tibetan capital Lhasa. Soldiers of the Tang dynasty could not sustain their presence in the hostile environment of the Tibetan Plateau and soon returned to China proper." Map of the Four Horn (administrtive divisions) of the Tibetan Empire in the 7th century. After having incorporated Tuyuhun into Tibetan territory, the powerful minister Gar Songtsen died in 667. 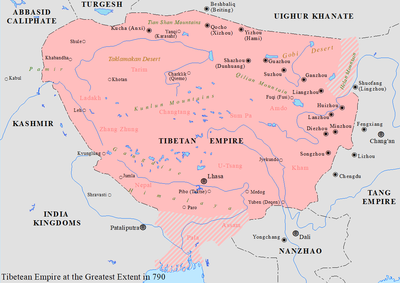 Between 665–670 Khotan was defeated by the Tibetans, and a long string of conflicts ensued with the Chinese Tang Dynasty. In the spring of 670, Tibet attacked the remaining Chinese territories in the western Tarim Basin after winning the Battle of Dafeichuan against the Tang dynasty. With troops from Khotan they conquered Aksu, upon which the Chinese abandoned the region, ending two decades of Chinese control. They thus gained control over all of the Chinese Four Garrisons of Anxi in the Tarim Basin in 670 and held them until 692, when the Chinese finally managed to regain these territories. In 685, minister Gar Tsenye Dompu (mgar Bstan-snyas-ldom-bu) died and his brother, Gar Tridring Tsendrö (mgar Khri-‘bring-btsan brod) was appointed to replace him. 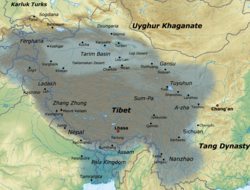 In 692, the Tibetans lost the Tarim Basin to the Chinese. Gar Tridring Tsendrö defeated the Chinese in battle in 696, and sued for peace. Two years later in 698 emperor Tridu Songtsen reportedly invited the Gar clan (who numbered more than 2000 people) to a hunting party and had them massacred. Gar Tridring Tsendrö then committed suicide, and his troops joined the Chinese. This brought to an end the influence of the Gar. From 700 until his death the emperor remained on campaign in the northeast, absent from Central Tibet, while his mother Thrimalö administrated in his name. In 702, Zhou China under Empress Wu Zetien and the Tibetan Empire concluded peace. At the end of that year, the Tibetan imperial government turned to consolidating the administrative organization khö chenpo (mkhos chen-po) of the northeastern Sumru area, which had been the Sumpa country conquered 75 years earlier. Sumru was organized as a new "horn" of the empire. During the summer of 703, Tridu Songtsen resided at Öljak (‘Ol-byag) in Ling (Gling), which was on the upper reaches of the Yangtze, before proceeding with an invasion of Jang (‘Jang), which may have been either the Mosuo or the kingdom of Nanzhao. In 704, he stayed briefly at Yoti Chuzang (Yo-ti Chu-bzangs) in Madrom (Rma-sgrom) on the Yellow River. He then invaded Mywa, which was at least in part Nanzhao (the Tibetan term mywa likely referring to the same people or peoples referred to by the Chinese as Man or Miao) but died during the prosecution of that campaign. Gyeltsugru (Rgyal-gtsug-ru), later to become King Tride Tsuktsen (Khri-lde-gtsug-brtsan), generally known now by his nickname Me Agtsom ("Old Hairy"), was born in 704. Upon the death of Tridu Songtsen, his mother Thrimalö ruled as regent for the infant Gyältsugru. The following year the elder son of Tridu Songtsen, Lha Balpo (Lha Bal-pho) apparently contested the succession of his one-year-old brother, but was "deposed from the throne" at Pong Lag-rang. Thrimalö had arranged for a royal marriage to a Chinese princess. The Princess Jincheng (Tibetan: Kyimshang Kongjo) arrived in 710, but it is somewhat unclear whether she married the seven-year-old Gyeltsugru or the deposed Lha Balpo. Gyeltsugru also married a lady from Jang (Nanzhao) and another born in Nanam. The Umayyad Caliphate and Turgesh became increasingly prominent during 710–720. The Tibetans were allied with the Türgesh. Tibet and China fought on and off in the late 720s. At first Tibet (with Türgesh allies) had the upper hand, but then they started losing battles. After a rebellion in southern China and a major Tibetan victory in 730, the Tibetans and Türgesh sued for peace. The Tibetans aided the Turgesh in fighting against the Muslim Arabs during the Muslim conquest of Transoxiana. By 750 the Tibetans had lost almost all of their central Asian possessions to the Chinese. In 753, even the kingdom of "Little Balur" (modern Gilgit) was captured by the Chinese. However, after Gao Xianzhi's defeat by the Caliphate and Karluks at the Battle of Talas (751), Chinese influence decreased rapidly and Tibetan influence began to increase again. Tibet conquered large sections of northern India during this time. In 755 Tride Tsuktsen was killed by the ministers Lang and ‘Bal. Then Takdra Lukong (Stag-sgra Klu-khong) presented evidence to prince Song Detsen (Srong-lde-brtsan) that they were disloyal and causing dissension in the country, and were about to injure him also. Subsequently, Lang and ‘Bal really did revolt. They were killed by the army and their property was confiscated." In 756 prince Song Detsän was crowned Emperor with the name Trisong Detsen (Khri srong lde brtsan) and took control of the government when he attained his majority at 13 years of age (14 by Western reckoning) after a one-year interregnum during which there was no emperor. In 755 China had already begun to be weakened because of the An Shi Rebellion started by An Lushan in 751, which would last until 763. In contrast, Trisong Detsän's reign was characterized by the reassertion of Tibetan influence in Central Asia. Early in his reign regions to the West of Tibet paid homage to the Tibetan court. From that time onward the Tibetans pressed into the territory of the Tang emperors, reaching the Chinese capital Chang'an (modern Xian) in late 763. Tibetan troops occupied Chang'an for fifteen days and installed a puppet emperor while Emperor Daizong was in Luoyang. Nanzhao (in Yunnan and neighbouring regions) remained under Tibetan control from 750 to 794, when they turned on their Tibetan overlords and helped the Chinese inflict a serious defeat on the Tibetans. In 785, Wei Kao, a Chinese serving as an official in Shuh, repulsed Tibetan invasions of the area. After his death, Mutik Tsenpo was next in line to the throne. However, he had been apparently banished to Lhodak Kharchu (lHo-brag or Lhodrag) near the Bhutanese border for murdering a senior minister. The youngest brother, Tride Songtsen, was definitely ruling by AD 804. Under Tride Songtsen (Khri lde srong brtsan - generally known as Sadnalegs) there was a protracted war with the Abbasid Caliphate. It appears that Tibetans captured a number of Caliphate troops and pressed them into service on the eastern frontier in 801. Tibetans were active as far west as Samarkand and Kabul. Abbasid forces began to gain the upper hand, and the Tibetan governor of Kabul submitted to the Caliphate and became a Muslim about 812 or 815. The Caliphate then struck east from Kashmir, but were held off by the Tibetans. In the meantime, the Uyghur Khaganate attacked Tibet from the northeast. Strife between the Uyghurs and Tibetans continued for some time. The men and horses all wear chain mail armor. Its workmanship is extremely fine. It envelops them completely, leaving openings only for the two eyes. Thus, strong bows and sharp swords cannot injure them. When they do battle, they must dismount and array themselves in ranks. When one dies, another takes his place. To the end, they are not willing to retreat. Their lances are longer and thinner than those in China. Their archery is weak but their armor is strong. The men always use swords; when they are not at war they still go about carrying swords. The Tibetans might have exported their armor to the neighboring steppe nomads. When the Turgesh attacked the Arabs, their khagan Suluk was reported to have worn Tibetan armor, which saved him from two arrows before a third penetrated his breast. He survived the ordeal with some discomfort in one arm. The Tibetan Empire's officers were not employed full-time and were only called upon on an ad hoc basis. These warriors were designated by a golden arrow seven inches long which signified their office. The officers gathered once a year to swear an oath of fealty. They assembled every three years to partake in a sacrificial feast. While on campaign, Tibetan armies carried no provision of grain and lived on plunder. The early Tibetans worshipped a god of war known as "Yuandi" according to a Chinese transliteration from the Old Book of Tang. They grow no rice, but have black oats, red pulse, barley, and buckwheat. The principal domestic animals are the yak, pig, dog, sheep, and horse. There are flying squirrels, sembling in shape those of our own country, but as large as cats, the fur of which is used for clothes. They have abundance of gold, silver, copper, and tin. The natives generally follow their flocks to pasture, and have no fixed dwelling-place. They have, however, some walled cities. The capital of the state is called the city of Lohsieh. The houses are all flat-roofed, and often reach to the height of several tens of feet. The men of rank live in large felt tents, which are called fulu. The rooms in which they live are filthily dirty, and they never comb their hair nor wash. They join their hands to hold wine, and make plates of felt, and knead dough into cups, which they fill with broth and cream and eat the whole together. ^ Chinese histories called the country 吐蕃, which is today pronounced Tǔfān or Tǔbō (see Definitions of Tibet#In Chinese). ^ Turchin, Peter; Adams, Jonathan M.; Hall, Thomas D (December 2006). "East-West Orientation of Historical Empires". Journal of World-systems Research. 12 (2): 222. ISSN 1076-156X. Retrieved 2016-09-14. ^ Rein Taagepera (September 1997). "Expansion and Contraction Patterns of Large Polities: Context for Russia". International Studies Quarterly. 41 (3): 500. doi:10.1111/0020-8833.00053. JSTOR 2600793. ^ Beckwith 1987, pg. 17. ^ Beckwith 1987, p. 16. ^ a b Richardson, Hugh E. (1965). "How Old was Srong Brtsan Sgampo", Bulletin of Tibetology 2.1. pp. 5–8. ^ Karmey, Samten G. (1975). "'A General Introduction to the History and Doctrines of Bon", p. 180. Memoirs of Research Department of The Toyo Bunko, No, 33. Tokyo. ^ Charles Bell (1992). Tibet Past and Present. CUP Motilal Banarsidass Publ. p. 28. ISBN 978-81-208-1048-8. Retrieved 2010-07-17. ^ University of London. Contemporary China Institute, Congress for Cultural Freedom (1960). The China quarterly, Issue 1. p. 88. Retrieved 2010-07-17. ^ Roger E. McCarthy (1997). Tears of the lotus: accounts of Tibetan resistance to the Chinese invasion, 1950-1962. McFarland. p. 12. ISBN 978-0-7864-0331-8. Retrieved 2010-07-17. ^ Beckwith, Christopher I. The Tibetan Empire in Central Asia. (1987), pp. 34–-36. Princeton University Press. ISBN 0-691-02469-3. ^ Beckwith 1987, pp. 14, 48, 50. ^ a b c d e Petech, Luciano (1988). "The Succession to the Tibetan Throne in 704-5." Orientalia Iosephi Tucci Memoriae Dicata, Serie Orientale Roma 41.3. pp. 1080–87. ^ Backus, Charles (1981). The Nan-chao Kingdom and T'ang China's Southwestern Frontier. Cambridge University Press. p. 43. ISBN 978-0-521-22733-9. ^ Beckwith, C. I. "The Revolt of 755 in Tibet", p. 5 note 10. In: Weiner Studien zur Tibetologie und Buddhismuskunde. Nos. 10-11. [Ernst Steinkellner and Helmut Tauscher, eds. Proceedings of the Csoma de Kőrös Symposium Held at Velm-Vienna, Austria, 13–19 September 1981. Vols. 1-2.] Vienna, 1983. ^ Beckwith, C. I. "The Revolt of 755 in Tibet", pp. 1–14. In: Weiner Studien zur Tibetologie und Buddhismuskunde. Nos. 10-11. [Ernst Steinkellner and Helmut Tauscher, eds. Proceedings of the Csoma de Kőrös Symposium Held at Velm-Vienna, Austria, 13–19 September 1981. Vols. 1-2.] Vienna, 1983. ^ Beckwith, Christopher I. (1993). The Tibetan Empire in Central Asia: A History of the Struggle for Great Power Among Tibetans, Turks, Arabs, and Chinese During the Early Middle Ages. Princeton University Press. pp. 108–121. ISBN 978-0-691-02469-1. ^ William Frederick Mayers (1874). The Chinese reader's manual: A handbook of biographical, historical, mythological, and general literary reference. American Presbyterian mission press. p. 249. Retrieved 2010-10-28. ^ A Corpus of Early Tibetan Inscriptions. H. E. Richardson. Royal Asiatic Society (1985), pp. 1–25. ISBN 0-947593-00-4. ^ Shakabpa, Tsepon W. D. Tibet: A Political History (1967), p. 47. Yale University Press, New Haven and London. ^ Shakabpa, Tsepon W. D. Tibet: A Political History (1967), p. 48. Yale University Press, New Haven and London. ^ Richardson, Hugh. A Corpus of Early Tibetan Inscriptions (1981), p. 44. Royal Asiatic Society, London. ISBN 0-947593-00-4. ^ a b Shakabpa, Tsepon W. D. (1967). Tibet: A Political History, pp. 49-50. Yale University Press, New Haven & London. ^ Ancient Tibet: Research Materials from the Yeshe De Project (1986), pp. 296–97. Dharma Publishing, California. ISBN 0-89800-146-3. ^ Beckwith 1987, p. 110. ^ Beckwith 1987, p. 109. ^ Bushell 1880, p. 410-411. ^ a b Bushell 1880, p. 442. ^ Walter 2009, p. 26.